The angle of inclination of the roof determines whether it will be flat or pitched. The steeper it is, the less snow is held on it. Flat roofs are not popular with developers. In winter and summer precipitation accumulates on it, and in autumn also leaves have fallen. The flat roof can be combined with the attic floor in which air ducts are arranged. Their construction requires less material consumption. Practice has shown that a dual-pitch roof is more suitable for individual building. A truss system must withstand heavy loads from wind, snow, and roofing material and therefore must be durable. With proper installation of the truss system, the load is evenly distributed on the walls of the building. Under tiled roofs, rafters are installed twice as often as under other types of roofing. 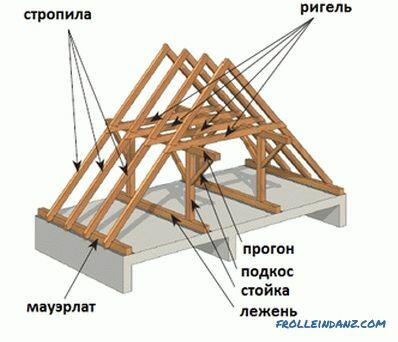 The rafter gable roof system is a complex structure that combines 2 inclined rectangular surfaces. It is better not to risk and buy documents for a typical project. The engineering solution will tell you what material the roof should be from and what angle of inclination is acceptable in this construction. The height of the angle depends on the climatic conditions. With a large amount of precipitation, it is usually made 45-60 degrees, which allows the snow cover under its own weight to slide and clean the roof. In addition, the calculation must take into account the constant load of the weight of the roof. 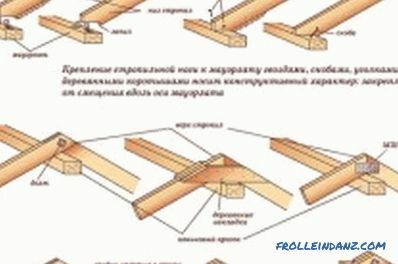 If the location of the rafters to the base resembles an isosceles triangle, then this is the best solution for construction, since it is the most durable. Depending on the weight of the roofing material, the rafter step is calculated. The standard pitch is from 60 to 120 cm. To ensure construction with materials, it is necessary to know the area of ​​one slope of the roof: S = (length x width x 2). 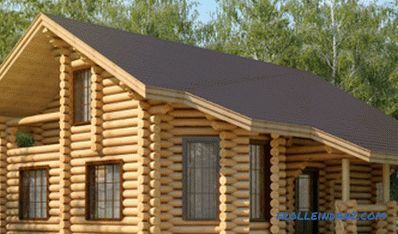 Then you should add to the result 2 the length of the protrusion of the roof above the gable. Scheme of hanging and inclined rafters. Hanging. Rafters, leaning on the walls of the building, create tension on their thrust. To remove it, the lower ends of the rafters are joined with a lower tie, forming a triangle. 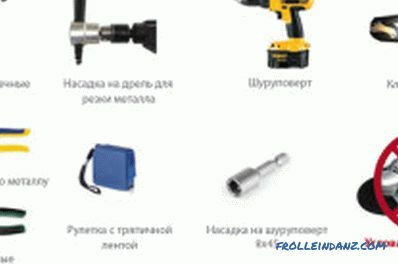 For greater strength during installation, an additional upper grip is installed. They can be made of wooden beams or metal, and the higher the connection with the rafters, the more durable it will be. 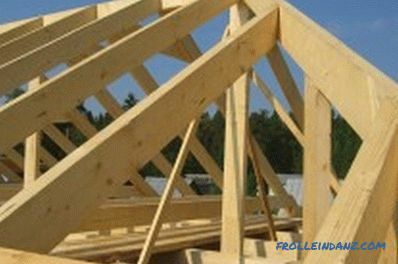 Fastening the beams to the ceiling joists is considered weak, especially in areas where strong winds are possible. Installation of hanging rafters is carried out if the distance between the external walls of the building does not exceed 10 m. An additional requirement is the absence of a supporting wall inside the room. Inclined. The installation of rafters is possible only when the distance between the supporting walls is up to 6. 5 m. At the same time, the rafter bars have additional, intermediate supports, which are supported by the inner wall of the house or the ground floor. If the blockhouse is made of wood, then the lower part of the rafters rests against the mauerlat - square beam, laid in one row on the waterproofing layer along the perimeter of the bearing walls. Section of a bar not less than 100 * 100 mm. Since the mauerlat is, as it were, the foundation for fixing the truss system, it must be rigidly fixed to the walls with anchor bolts with metal plates. When building walls of brick or reinforced concrete, metal rods with a diameter of at least 10 mm and a distance of 1.5 m between them are embedded in the masonry of the upper rows. Threads are cut into them. Mauerlat laid on a layer of waterproofing and hold it with rods and bolts with a washer. A beam to which the rafters are attached on both sides of the bearing walls is called a ridge. It can be made both from the whole bar, and accrued (if the length of the bar is not enough). The durability of the walls and the beauty of the house depend on the proper arrangement of the overhang. His ledge above the walls is usually 40-60 cm. Wooden overhangs are usually made of 3 types: on the rafters released beyond the walls (grassholes nailed to the rafters and serving as their continuation); on the sleepers with a filing underneath and on flats (with the police). 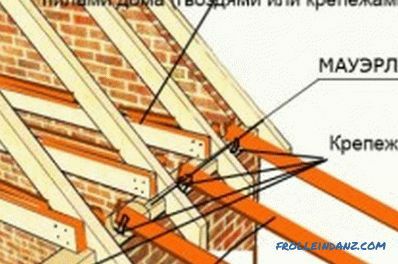 If the length of the rafter leg is not enough for the release of the overhang, then the building in bars is carried out from below. Under the junction establish an additional rack. To create a solid roof that can withstand heavy loads, it is best to use the installation of rafters in a combined way, i.e., use both types of hanging and inclined. Designed for the work of the beam must be of high quality and treated with antiseptic. 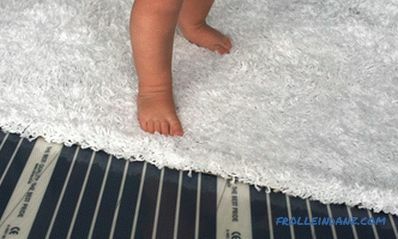 The standard size is 50 * 150 * 6000 mm. With a longer beam length, it is recommended to increase the height of the beam to 180 mm. The installation of rafters should be carried out in pairs, i.e., having installed on one side, immediately install on the opposite side. All the work on marking and preliminary fitting of parts is done on the ground. Technology for mounting a truss system to a power plate. To ensure stable support on the two bars, the lower frames are made by the size of the power plate. Measuring and noting the intersection on the upper parts, also cut in half the thickness of the timber. When fastening overlapped, the top joint should be integral, without protrusions. A template is made to cut and cut. It is usually made of plywood or cardboard as follows. 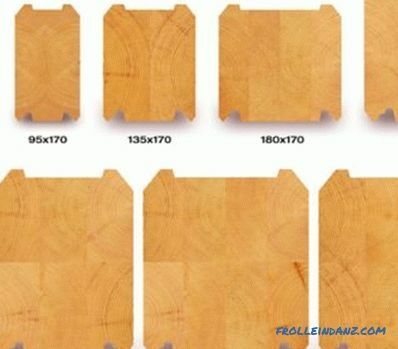 Two identical plywood blades are cut out according to the drawing and are nailed exactly one against the other to the edges of the board, equal in width to the parts to be joined. Putting the template on the ends of the bars, pencil contour. The cut cut to the lined lines will be tight. Cuttings and cuts should be simple in execution, as complex ones are unreliable and require extra time and effort. Planes make them, if possible, perpendicular to the load forces that act along the wooden elements. First, hold the mount on the mauerlat with nails. Next, you need to determine the step rafters. Knowing the dimensions of the material from which the truss system will be made, and the distance between the supports (supports is mauerlat, struts, racks, upper ridge girder, place of rafters at the top), according to the table, you can determine their pitch. Between Installed lateral rafters tighten the cord. 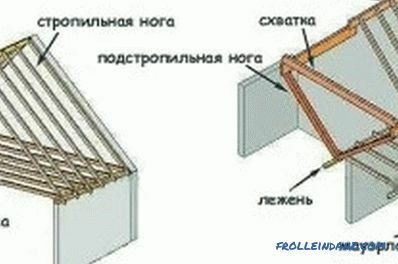 It is necessary to adjust the height of the rafter legs. In the case of a slight deviation, a wooden lining is made. To increase the strength of the truss, additional fastening is carried out with braces from the bottom of one truss foot to the middle of the opposite one. The thickness of the strut can be no more than 50 mm. Such a diagonal mount reduces the load on the rafters with a strong wind load or large snow cover. When large spans are mounted, the struts are installed. They transfer the load from the rafters to the bearing walls and are installed at an angle of more than 45 degrees. The connection of the struts with the support stand and we lay spend pins. To enhance the strength of the rafters fasten tightening - horizontally fixed between their pairs of bars. 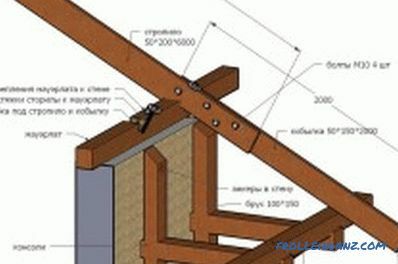 Previously, their upper part is fastened with nails to a horizontally laid board (ridge knot), after which a tightening is installed, which does not allow the rafters to disperse to the sides. The truss system will be more durable if diagonal connections are additionally established. One end of the board, section 25 * 50 mm, is fixed with a metal plate to the heel of the first rafter, the second is fixed in the middle of the next one, etc. The length of the board is measured at the attachment points. This will be a template. The remaining boards are cut by the number of spans. To increase the strength of installation of a rafter foot to the mauerlat, fastening is carried out with steel, galvanized plates and bolts. Ridge knot also strengthened with metal plates with bolts or screws. The material for the manufacture of the battens is dry and antiseptic treated wood.The quality of the structure depends on its quality. Build the crate in a continuous or sparse way, depending on the severity of the roofing material. Also, sheathing can be single or double layered. 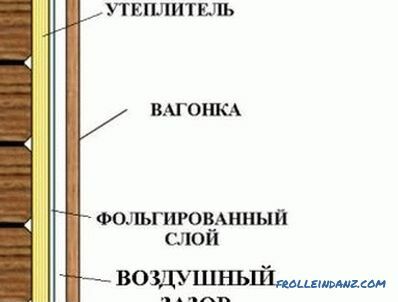 In the case of a single-layer version, the installation of bars is perpendicular to the rafters. At the ridge, two bars are laid side by side, with no gap between them. In the two-layer version, boards or other lumber are attached to fixed bars parallel to the rafters. Glued laminated timber - disadvantages and advantages. 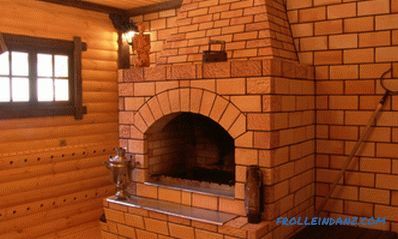 Production in compliance with the exact technology, dignity compared with the quality characteristics of conventional timber.